Every day we manufacture Promotional and retail customisable paper bags and some just stand out above all others. 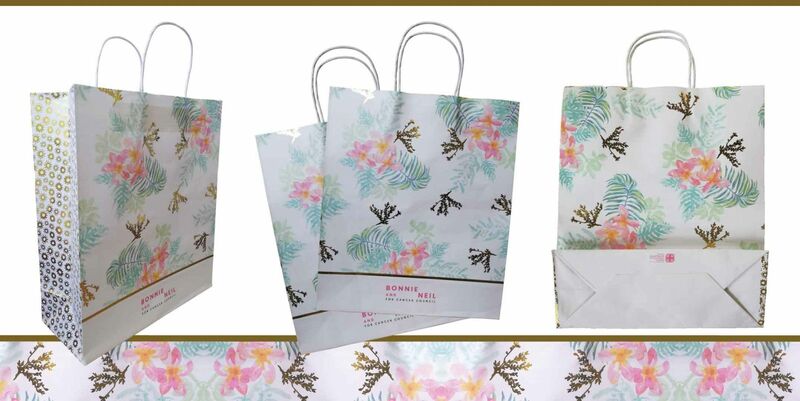 These custom designed paper bags have been printed with gold fleck and in CMYK all over and we manufactured these using our economical overseas promotional products china manufacturing processes saving our customer up to 50% while deliverying a quality experience. The design and feel of this bag ensure that our clients brand & product market position continues to follow not only the product that is ordered at counter but also right through to the promotional give away and trade marketing collateral, thus ensuring an end to end brand story. Why take on a standard product when Seamless Merchandise can custom design and manufacture your promotional products more economically than you can add your logo to a stock product*. For custom or stock plush toys or talk to one of our award wining staff directly.